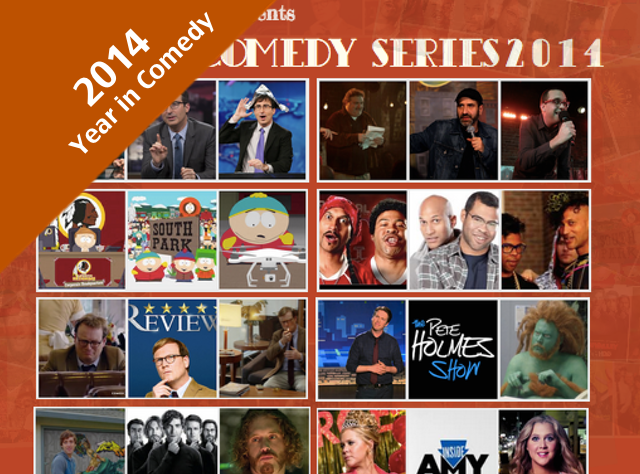 The great comedy in 2014 wasn’t just limited to stand up. There was also outstanding comedy on television. Comedy Central really upped their game this year, with five of our top ten programs coming from the all-comedy network. All five of those shows — Dave Attell’s Comedy Underground Live, South Park, Review, Inside Amy Schumer and Key & Peele — brought completely different elements of comedy to the channel. Brooklyn Nine Nine, Last Week Tonight, Comedy Bang Bang, Silicon Valley, and The Pete Holmes Show all created must see television too. And we’ve left off many great series, these are only the tip of the iceberg– more proof of the strength of comedy in 2014. Brooklyn 99 (FOX). ‘Brooklyn 99’ had all the promise to be a great show before it even aired. A cop show with an all star cast like Andy Samberg, Andre Braugher and Terry Crews sounds promising, and thanks to the former producers of ‘Parks & Recreation’ it was able to start off great. With great supporting characters led by the scene stealing Chelsea Peretti, ‘Brooklyn 99’ was a great comedy from the first episode, while most shows take some time to get their footing. It wasn’t that big of a surprise when they won the Golden Globe for best comedy even though their first season had yet to conclude. Although ratings challenged, ‘Brooklyn 99’ should keep getting better as the seasons go on. Comedy Bang Bang (IFC). ‘Comedy Bang Bang’ really came into it’s own in it’s third season as the fake talk show began to go in even more experimental directions, such as airing their series finale in the middle of the season and traveling back in time to the 1960’s for a throwback episode. With great joke writing and gags that change from episode to episode, ‘Comedy Bang Bang’ became a great show for people that are willing to tune and expect something unexpected. Dave Attell’s Comedy Underground (Comedy Central). The basic premise behind ‘Dave Attell’s Comedy Underground’ has been done before: Three comedians get to do a short set during half hour show with the same host each week. So how did Attell make it one of the most original shows on television? By getting rid of the usual setting, camera setup and restrictions on material that come with most stand up shows. Filmed at the Village Underground in NYC (an actual comedy club) and filmed up close-guerrilla, ‘Comedy Underground; gave viewers the chance to see how a performance in a NYC club really is, and gave us one of the best shows of 2014. Pete Holmes Show (TBS). ‘The Pete Holmes’ show may have been cancelled, but it became one of the funniest and original comedy shows in it’s short run. Hosted by veteran comedian Pete Holmes, the late night show was a true variety show for comedy fans, featuring interviews and performances by some of the funniest up-and-coming comedians working today, abandoning the usual set-up of celebrities coming on to promote their latest project. Partnered with hilarious digital shorts and the extremely likable Holmes, it’s a shame the show was cancelled before it really got the chance to mix things up in late night. Key & Peele (Comedy Central). ‘Key & Peele’ has been a rising comedy show since it’s inception in 2012, but 2014 was when it really took off, combining hilarious sketches with impressive production and directing that made the show seem even better than the things it was spoofing. With great guest stars from across the comedy world, ‘Key & Peele’ tackled every stereotype & race equally, with great writing backing it up. The immensely popular show will be back in 2015 and theirs no telling what they might have in store. Inside Amy Schumer (Comedy Central). The second season of ‘Inside Amy Schumer’ picked off right where the show had left off but with even better writing and the uber-talented Schumer leading every sketch. The show was packed with sketches that challenged viewers alongside ones that made you cringe, all while being hysterical. Schumer is an expert at self-deprecation, starring in sketches that poke fun at different aspects of her life that viewers can also relate to, from choosing a movie to watch with your significant other to riding in an elevator with an annoying neighbor (albeit without Colin Quinn. Schumer is on the verge of being the biggest name in comedy, and he show is he perfect example why. Silicon Valley (HBO). ‘Silicon Valley’ was arguably the best new comedy of 2014, featuring an ensemble cast that complemented each other perfectly from the GetGo. Following a growing tech start up in California, ‘Silicon Valley’ introduced Thomas Middleditch as Richard Hendriks, and familiar comedy faces like TJ Miller, Kumail Nanjiani, and Martin Starr. Creator Mike Judge brings the same level of satire to the show that made ‘Office Space’ so great, and in turn, made ‘Silicon Valley’ the funniest show HBO has made in years. Review (Comedy Central). Based on the Australian show of the same name ‘Review’ stars comedian Andy Daly as Forrest MacNeil, a reviewer of life experiences who must complete every review submitted by viewers of his show no matter how illegal or life altering they may be (ie, stealing, getting a divorce). What really sets it apart from other shows is that the bad choices that Forrest must make stay with him as the season goes on, slowly breaking him down episode by episode. ‘Review’ may be the most unconventional comedy of 2014, but it is one of the funniest. South Park (Comedy Central). ‘South Park’ has been a television staple for nearly two decades, and 2014 has shown that creators Trey Parker and Matt Stone have no intention to slow down. 2014 has been one the funniest season that the show has had in years, with topical plot lines and social commentary mixed with the type of humor the show is known for. What really sets South Park apart from it’s other season’s is the shows experimentation with week-to-week continuity, allowing choices the characters make follow them as the season has progressed. The move has paid off, as fans have seen the show be as funny as it’s ever been. Last Week Tonight With John Oliver (HBO). 2014 was a banner year for John Oliver. He stepped in as host of the Daily Show over the summer when Jon Stewart went to direct his film, Rosewater. That would be big enough for anyone out there today, except Oliver blew up even more. Not only did he do an amazing job sitting in for Stewart, which that in of itself was a hard enough task, he made it look easy. He made everyone stop and think for a second that if Jon decided to step away forever, maybe we’d be ok with this Brit taking over the Daily Show desk. When that was said and done, even bigger news broke for Oliver – he was getting his own late night TV gig on Sunday nights for HBO, Last Week Tonight with John Oliver. Most people wondered if it would just be some Daily Show clone but out of the gate, Oliver was able to distance himself from old show while at the same time endearing everyone to his knew gig. John Oliver has proven to all that he’s got the chops to host and host well. Bonus points for taking the job on a Sunday night, nowhere near his old bosses.